Use the Orba car hire price comparison website tool below to quickly find the cheapest car hire for Orba in Spain in just seconds. The free price comparison search engine below will compare all the current Orba car hire deals and car rental rates to give you the lowest and cheapest car hire for Orba. The price comparison tool will compare all the latest Orba car hire quotes and prices and car rental rates between the major international brand name car hire companies as well as national and local Spanish car hire companies saving you both time and money. It is free to use – just put in your dates for your car hire Orba and tell us what type and size of car you want to hire – then let the price comparison booking engine do the rest! Before you start searching for cheap car hire Orba, note that you must be at least 21 years of age and have held a full driver’s license for at least a year. Orba is a small picturesque village located in the Orba Valley on the Northern Costa Blanca in Spain. Many expats have made their homes in Orba over the last decade owing to its location and climate. Orba is located fifteen kilometres inland from the sea side resorts of Javea and Denia and Orba benefits from hot summers and mild winters. To find out exact average temperatures visit our Orba weather page. Orba is a village situated amongst orange groves and is easily accessible from the N332 via Pedreguer and Benidoleig. From many of the urbanisations which have luxury villas and swimming pools one can admire the views of the valley and the Mediterranean Sea in the distance. Many people have bought second homes in Orba and rent them out over the summer so there are many new tourists annually visiting Orba. Most people will opt to hire a car in Orba in order to make the most of their holidays and to be able to o some sightseeing and spend days at the beaches of Denia, Javea and Oliva. Orba itself is such a small village that although it has all the infra structure one needs to enjoy a good holiday, a car rental agency at this moment time is not in the village itself. 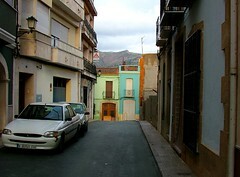 Denia is the nearest large resort and here one can hire a car in all classes and price categories. Use our Orba map for driving directions. Is it difficult to rent a car in Orba? What requirements do I have to meet? Denia is ten minutes away by car and usually requirements include a valid driver’s license and a credit card in the name of the person renting. You can use a debit card, but you may have to present a third form of identification such as a round-trip airline ticket, travel itinerary, valid passport, current vehicle insurance or a current copy of a utility bill. The easiest way to hire a car from the airport and from there one can easily make their way to Orba. Orba has two airports of almost equal distance that one can fly to which are Alicante Airport to the south and Valencia Airport to the north. Will I be able to hire a car in Orba? The nearest car rentals are available in Denia which is less than ten minutes away by car. You can rent by the day or by the week. Hiring a car by the week is usually the most economical option, and may sometimes be as low as €135 per week. Yes. Most Denia car hire companies will give you a 100% refund of your purchase price if you should decide that you don’t need a car rental. Renting a car in Orba a good idea because it is a picturesque village where one can get to many tourist resorts within a few minutes by car. Things to do while holidaying in Orba are to visit the Jalon Valley with its bodegas and markets, the Cuevas of Benidoleig are less than five minutes away by car. The Vergel Safari Park is located near Pego over in the next valley which is the Pego Valley. Orba is amongst a few Orba Valley villages which include Benidoleig, Sagra, Tormos, Rafol d’Almunia, Benimeli, Sanet y Negrals and Beniarbeig. Nearby sea side resorts which have fantastic blue flag beaches include Javea, Oliva and Denia. Benidorm with its theme parks and beaches is less than an hour away by car. If one has hired a car one will certainly be able to make the most of the Northern Costa Blanca apart from spending days at the villa beside the swimming pool. Orba is a very small town and the best option is for you to immediately hire a car for the duration of your stay from either Alicante airport or Valencia airport. Alternatively get an airport transfer by either taxi, mini-bus or private shuttle bus to Orba and stay in your resort and get taxis when you want to get out and about. We have carried out extensive research comparing all the major Alicante airport car hire companies. These include: Advantage, Budget, Dollar, Alamo, Easy Car, Enterprise, National, Goldcar, Thrifty, Sixt, Victoria Rent a Car, Sol Mar, Record Rent a Car, Hertz, Auriga, Europa, Europcar, Atesa, Avia and Centauro Rent A Car. We have found when hiring a car in Orba you need to shop around – there is no Orba car hire company that is always the cheapest. Much depends on your dates and the availability of the various models of car hire that each Orba car hire company has for those dates. Contacting each Orba car hire company can take hours and hours and be very confusing so the best way to find cheap car hire in Orba is to use a car hire search-engine which trawls the web in seconds and scours all the reputable Orba car hire companies with your specific information i.e. the dates for your Orba car hire, where you want to hire the car from (and drop it off), the size of car hire needed etc. If you click on the link above you will go to a page containing the best search engine for cheap Orba car hire that we have found. It’s from an independent company called Car Trawler. They have special discounted internet rates with all the major Orba car hire companies and using their tool they compare all the rates from the various Costa Blanca car hire companies and then give you the cheapest price for car hire for Orba. Cheap car hire in Orba – Page Summary – This page contains unique content about our Orba car hire price comparison website tool which compares and finds you the lowest and cheapest prices for car rental and car hire from Orba in Spain.